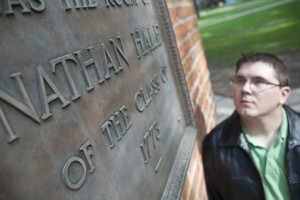 Raising Hale is a media project of the Yankee Institute for Public Policy. We believe that by observing government, we change it. After more than four years of regular reporting on government waste, fraud and abuse in Connecticut, Raising Hale is on hold. We continue to maintain this site so readers can access archived articles. For current reporting by Yankee Institute’s new investigative reporter, Marc E. Fitch, visit YankeeInstitute.org. Nathan Hale, Connecticut’s most famous Revolutionary War hero, provides the inspiration for this site. Hale believed Connecticut could have a better government – and he sacrificed his life for it. We are grateful for the freedoms Hale died for and we plan to Raise Hale by exercising them. Zachary Janowski, founding editor of Raising Hale, is still on staff at the Yankee Institute as director of external affairs. You can reach him at zach(at)yankeeinstitute.org.